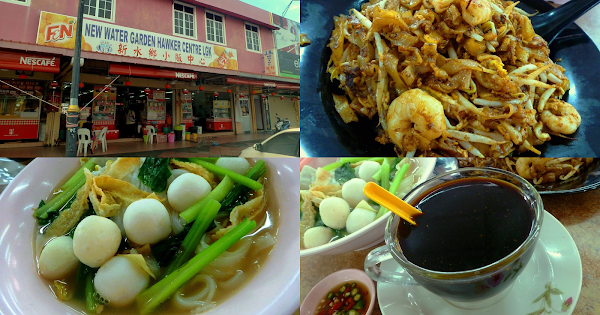 New Water Garden Hawker Centre Langkawi (新水乡小贩中心) is breakfast place in downtown Kuah. There are around 10 stalls in total. Most customers are locals, which is a good sign for me. The bowl of Kuey Teow Soup (粿条汤, RM5.50) contains several fish balls that are made from wolf-herring (西刀鱼). I think there is too much flour; I prefer more fish. I also feel that the soup is saltier than necessary and lacks savoriness from meat or fish. The good news is that a lot of choy sum (菜心) is used. The plate of Char Kuey Teow (炒粿条, RM6.00) is on the spicier end of my tolerable range. I think it is prudent to tone down the amount of chili paste, or at least check with customers first. There is also a general lack of "fiery aroma" (镬气) that I would like to see in this dish. Kopi (RM1.30) is my caffeine fix before another lengthy sightseeing trip. Basically, the coffee is prepared from locally-roasted beans and sweetened condensed milk. At night, New Water Garden operates as a seafood restaurant called Rootian Seafood Restaurant (露天海鲜饭店). I wonder how it compares with Wonderland Food Store?